Any game can sell. But any game that sells can collect dust a week after it is bought. These are the 20 games that collect the least dust, that get played the most per user. Welcome back to Kotaku's monthly update of Nintendo Wii stats. At the beginning of each month we provide the latest look at which 20 games are getting the most use, per gamer. 1) No! This is not a list of the top-selling Wii games. 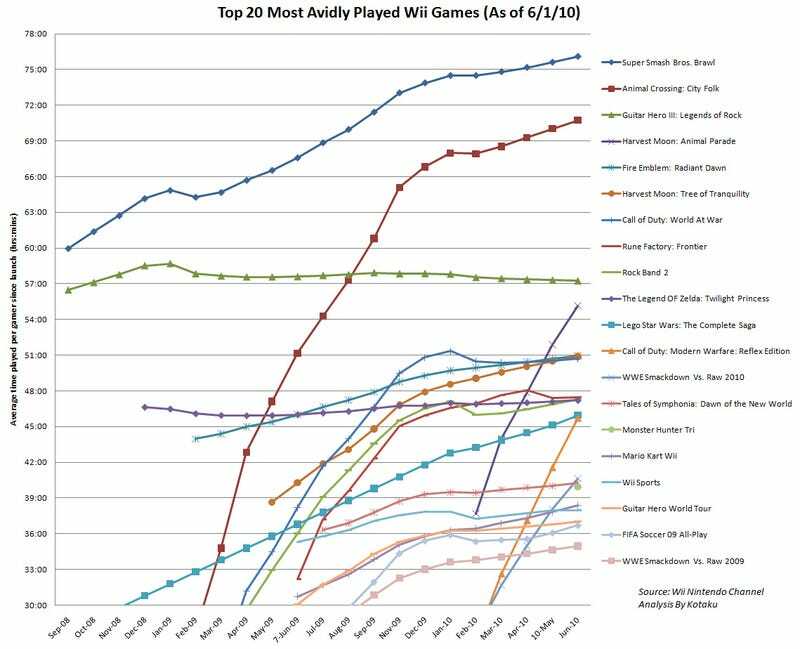 This is a list of the games, according to public data distributed by Nintendo, that get played the most by people who have either rented or bought the game. 2) Yes! Those numbers you see are hours and minutes, tallied from the day the game launched. The average Smash Bros. owner is not playing 70-plus hours of the game each month. That would be unhealthy. They've logged those hours since they first got the game, be it launch day or otherwise. 3) See for yourself. Just click the chart to enlarge it. 4) We don't do this for the Xbox 360 and PS3 because data isn't available for those systems. Okay, now we have that out of the way. This is the month that Monster Hunter Tri arrives on the chart. Long-time readers of this stats series know that I've been wondering if any game can knock Smash Bros. from its dominant perch. I thought Animal Crossing could, but it has lost steam. Some readers predicted Monster Hunter Tri, a game with a devoted fanbase and dozens of hours of entertainment, could supplant it. Given Monster Hunter's near-40-hour debut, it just might have a chance. Do you think Monster Hunter can claim that top spot? Harvest Moon: Animal Parade has some nice momentum as well. Here's the Top 20 games from the chart in list form. Let me know what you think of it. I'm including the cumulative lifetime play-time counts, as of June 1, 2010 in hours and minutes. You can see just how close some of these games are. Zelda and Rock Band 2, for example, are so close!